Camping in Yosemite offers visitors the unique opportunity to be surrounded by nature’s wonders, including sub-alpine lakes, towering and snowy peaks and some of the best views in the country. Camping in Yosemite National Park is a popular activity, with 13 lovely campgrounds, seven of which are on a reservation system. You will enjoy the summer months in Wawona, Crane Flat or Tuolumne Meadows. Yosemite Valley campgrounds are probably the most crowded, but offer the most incredible views. Reservations: Reservations are required for Yosemite Valley’s campgrounds and from summer through the fall for Wawona and Hodgdon Meadow, as well as half of the Crane Flat and Tuolumne Meadows sites. For reservations call 877-444-6777. Length of Stay: From the first of May to mid-September, the limit on your length of stay is 14 days, and only 7 of those days can be in Wawona or Yosemite Valley. Otherwise there is a 30-day camping limit within the park for a calendar year. 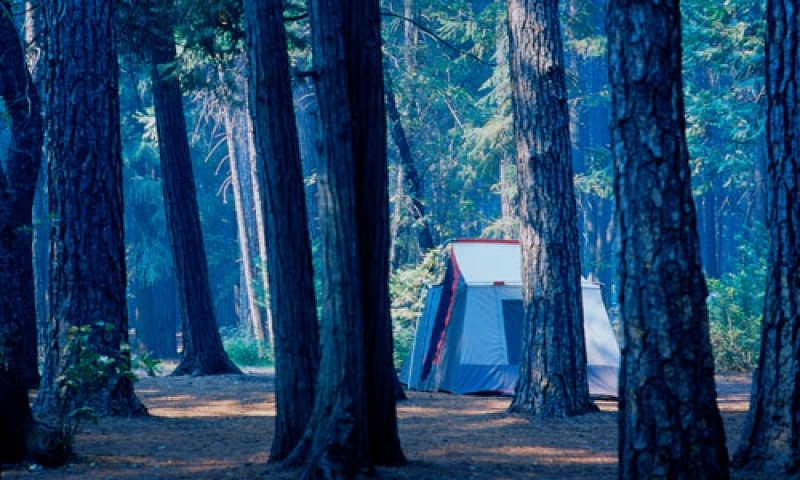 Camping Areas/Locations: You will find a listing of all Yosemite National Park campgrounds. Season: Four of Yosemite’s 13 campgrounds are open all year. Those not open all year in Yosemite Valley typically open sometime in April and close again at the beginning of November. South of the valley, the one campground that isn’t open the year round opens in the beginning of July and closes mid-September. North of Yosemite Valley, open dates often depend on when Tioga Road opens after its winter closure, and campgrounds here close either in mid-September or mid-October. Fees: Fees range from $5 to $20 depending on the campground and the time of year. When Yosemite backpacking trips take you out of the park boundaries, you’ll find Sierra National Forest has numerous campgrounds to serve your needs. This national park borders Yosemite on the western slope of the Sierra Nevada Mountains, with 1,300,000 acres of pristine forestland. Length of Stay: The maximum length of stay in most of Sierra National Forest campgrounds is 14 days. Summerdale Campground is 1.5 miles south of Yosemite National Park’s southern entrance and 12 miles north of Oakhurst. This campground has good shade on Big Creek. Drive south on Highway 41 to the campground entrance. Mammoth Pool Campground is on the San Joaquin River, south of Yosemite. Take Highway 41 south to Bass Lake Road, turning left and following it to Mammoth Pool Road. Turn left and continue four miles to the campground. Placer Campground is at Mammoth Pool, south of Yosemite. Boating is popular here. You can reach the campground by taking Highway 41 south from Yosemite to Bass Lake Road, and then turning left on Mammoth Pool Road. It’s another ½ mile to the campground turnoff. Forks Campground is at Bass Lake, with access to the lake and set in a shady area of pines, oaks and cedars. Go south from Yosemite on Highway 41 to Bass Lake Road, taking a left and driving to the Bass Lake campground office. Season: The Sierra National Forest campgrounds are generally open from May to September each year. Fees: Camping fees are typically from $18 to $22 per night with any additional vehicles charged $5 per night. Yosemite backpacking trips to the west of the park will take you into Stanislaus National Forest, with its more than 895,000 acres, 78 lakes and 811 miles of streams and rivers. A great place to camp out under the stars! Length of Stay: The campgrounds in Stanislaus National Forest have a maximum stay permitted of 14 days. Camping Areas/Locations: There are numerous campgrounds within the national forest, and these are some fairly close to Yosemite National Park. Cherry Valley is near Groveland, west of Yosemite National Park. From Groveland, go east on State Route 120 to the Cherry Lake sign (about 13.5 miles). Take a left onto Cherry Lake Road, a little over 5 miles to the “Y” intersection. Bear left and drive for 3.1 miles to the “T” intersection. Turn left and go .4 miles on Forest Route 14 to the sign for the campground. Diamond 'O' Campground is a large loop within a stand of pines providing ample shade. Take State Route 120 from Groveland, heading east for 28.8 miles to the sign with a tent symbol. Turn left on Forest Route 12. The campground is 5.7 miles on the left. Clarks Fork Campground is in the Clark Fork Recreation Area, surrounded with lovely conifers and lodgepole pines. From Mi-Wuk, you drive east on State Route 108 to the Clarks Fork sign (about 33.6 miles). Take a left after the sign and you’ll arrive at the campground in 5.8 miles. Season: This national forest’s campgrounds are generally open from the end of April to late September or the beginning of October. Fees: The typical fees for a campsite in Stanislaus National Forest are between $17 and $21 a night.